I guess people still show up here sometimes, or so Facebook informs me. I had such good intentions once I started teaching preschool to share lesson plans - moving beyond just mom and kid activities. But putting preschool teaching life and mom of 4 kids life together apparently didn't make for a lot of space for me to share ideas I've tried and used. This school year is just about wrapped up and as I'm finishing up my last few lessons plans, I've just barely started to think about what fun my kids and I can have this summer. Depending on the year, I have made a big wish list, had great learning activities, super fun adventures and really packed it in with a plan. Other years we've put together a very loose idea list but mostly spent the 3 months of freedom being spontaneous while still doing all the aforementioned awesome stuff. I've found that goals sort of get us in the right direction. The summer before last, the goal was to hike 50 miles with the kids between Memorial and Labor Day. We almost made it! I had a friend who recently moved away ask for some ideas on working with her son at home to make things a little more interesting while practicing numbers and letters. This will be a rather dry post, but hopefully useful to anyone who can't send their child to preschool, perhaps prefers to have them learn exclusively at home, or even to supplement classroom learning. There are not a lot of supplies needed and if you don't have them on hand, they can easily and cheaply be purchased at the dollar store, thrift store (I get many games at thrift stores just for the pieces) or even made by cutting up colored cardstock (for more fun and variety) and using a marker to write on them. When I say "you" below it will refer to the child. These are just simple paper circles with numbers on them. Place them in order, say the name of each as placing and/or name (count) them once all laid out. Mix them up and point to a number and name it. Using the same number set and adding another (this is just from our Rummikub game). This is just basic number matching. As with above, you can name them as you place them. Using a number set, place counters by each number equal to the number value. To make things more fun, using a variety of items for counters will help, or even mix and match. I know you can get these glass gems at the dollar store. To make a full 1-10 set you will need 55 pieces (210 for 1-20). Other items you can try are beans, coins, paper clips, mini erasers (the $1 spot at Target has 60 piece sets right now that would work great), basically anything that can be counted. Using a little bag, box, or anything that will hide the number set, draw out a number and then place that number of counters by it. This will help in actual counting vs. just knowing there is one more than the last as in the game above. Also using the bag, pull out a number at random and practice writing it. You could even pull out 2 numbers - one representing which number to practice, the other representing how many time you have to write it down. The same game can be played with a die or dice. (You can buy a 10 pack at the dollar store or dig one out of a game already in your closet). This version will help them to count and then reflect on which written number represents it before writing it from memory. Another game can be played using a set of dominoes (I got this mini set at the dollar store) and a pair of dice. Pull a domino out and then find the face on each die that matches. Say how many dots are on each die. Pull out a domino and place counters next to them, matching the number of dots with the counters. The domino set can also be used to match to the number sets. You can also do some basic math with the dominoes. Pull a domino out, count the number of dots and place the total number below domino. Same two games with a single die or dice. Match dots to number. Add another row with the sum of the 2 numbers. Similar to above, but with different pieces. Roll the die, place matching number of counters below. This one is good for matching and fine motor skills. The cardboard is just an old cereal box. I wrote the numbers here, but a child could easily do that part first. Just write some numbers on the clothespins (again, purchased from the dollar store) and then match to numbers on the cardboard. For an added level of difficulty, try this with the number matching to the number word. This is good practice for sight words. Switching over to letters. Write a capital letter on one side of the clothespin and lower case on the other. Match capital letter clothespin to lower case letter on cardboard. Lower case clipping to capital. For an added challenge put letters in a random order (the same can be done with the numbers). For this activity use a game like Scrabble, Upwords, etc. or just cards with handwritten letters. Like above, place a full set of 26 in a bag or hat and pull one out, say what it is, what it sounds like and/or write it down. Repeat for the entire alphabet if possible. 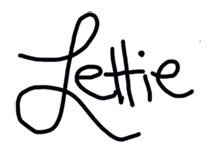 Same as previous activity, but write the lowercase version of the letter. For this one I just pulled out a few letters that made a real word. You (the parent this time :) )could have a list of names or places that your child is familiar with in addition to simple CVC words and sight words. Those could be drawn out of a bag as well. Drawing out letter tiles, practice writing letter in salt (or corn meal, shaving cream, finger paint, etc). 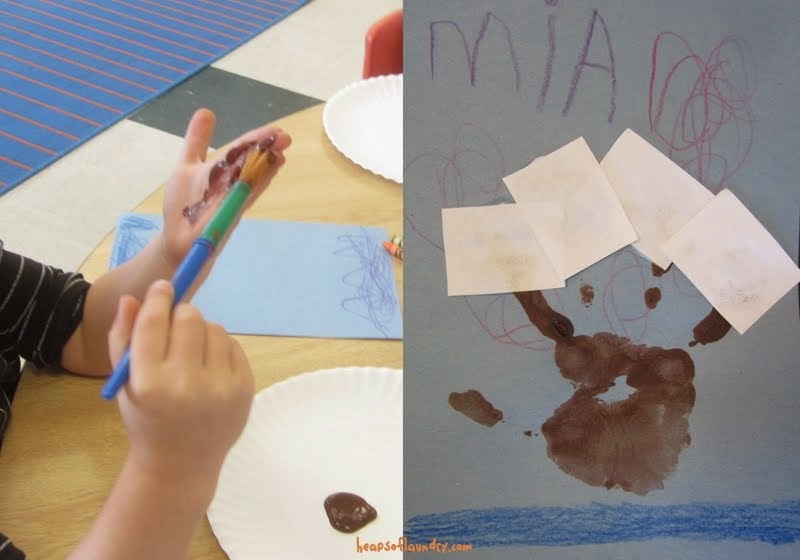 By changing the substance the writing is done in, this activity can be a great sensory experience as well as just making it not be boring after a few times. For an additional sensory experience, add a little bit of spice to the salt (cinnamon, cloves, ginger, garlic power, etc.). The "erasing" part is fun. It just takes a gentle side to side swish. Ideas for trays: cheap ones at dollar store, this one is a lid from a candy tin, cookie sheet, clean/unused meat tray from the grocery store, lid of a shoebox. 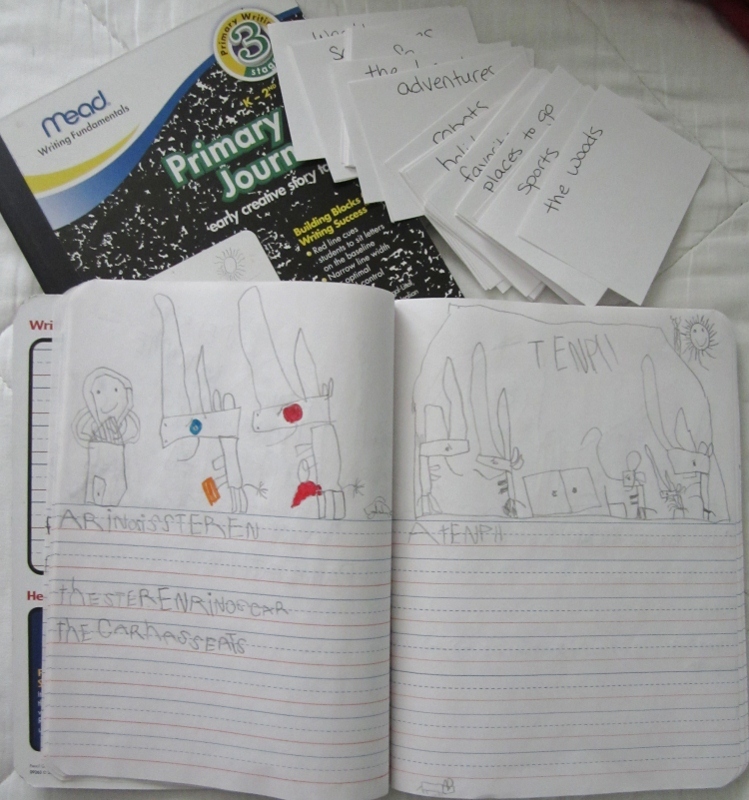 The activity can be done using a writing instrument too. Try the back side of a pencil, a craft stick, a stick from outside, a princess wand, and the ideas go on. Draw a letter out and recreate with counters. This would be great to do with a white board. One way is for an adult to just write a letter and the child covers it with counters. The letter can be picked at random or drawn from a bag/hat. 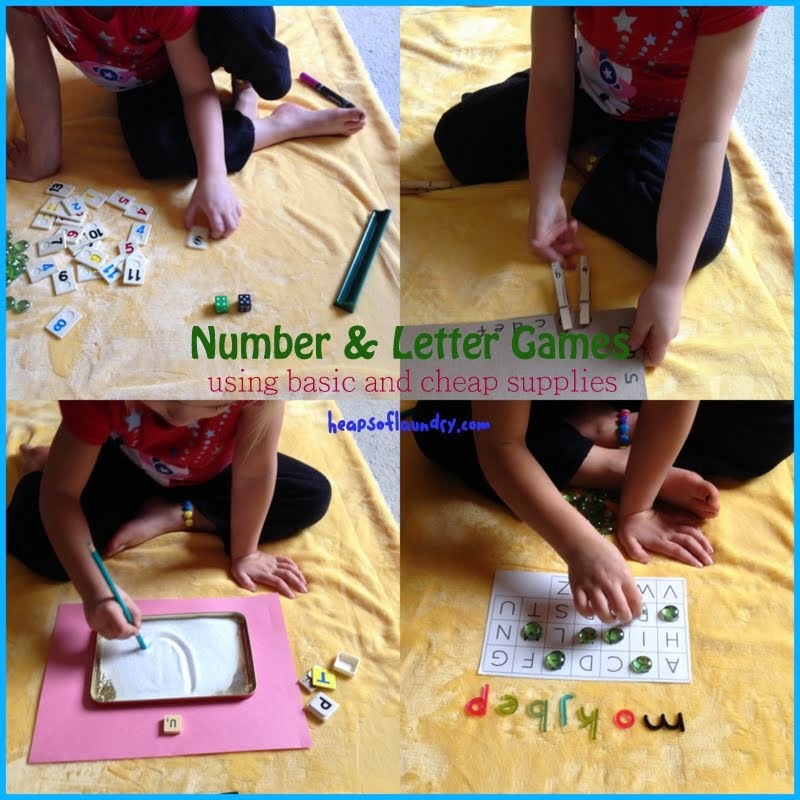 Another way is for the child to pull a letter out, then write it themselves and then cover it with counters. This is just a basic alphabet I typed up on Excel, it can be quickly just written on a piece of paper too. I'd recommend a lower case version as well. Draw a number from the bag and match it. Pretty simple. Similar to the clothes pin version of this, a paper with the alphabet jumbled up would help increase the difficulty. Again, say the name of the letter and the sound it makes as much as needed while playing these. Maybe even add in a word that starts with that letter. Because I don't have a lower case chart, but do have a set of lower case letters, we used our counters like a Bingo game, finding the capital version of the letter. This is another sensory activity that most kids seems to enjoy. It's a letter hunt. Mini sensory bins to not have to be elaborate. This is just a large-ish Ziploc disposable container. I like getting the fill from bulk bins at the grocery store. Beans, rice, lentils, shredded paper, even shaving cream are fun fillers. Last one for now. Letter sort. This is one where I'd recommend having a few different colors and fonts, both upper and lower case letters. Start with just 3 letters (but 5 or so of each of them - like 5 Ls, 5 Qs and 5 Hs or something like that) to sort. To increase difficulty, use more letters at once (either number of or letters) or use letters that have similar features. Um, hi, hello. I know we have been absent. I know we (mostly me) keep saying we'll post this or that and then silence for months. But people are visiting! Thank you. More than 100 people a day are here visiting our site and I am just so surprised! 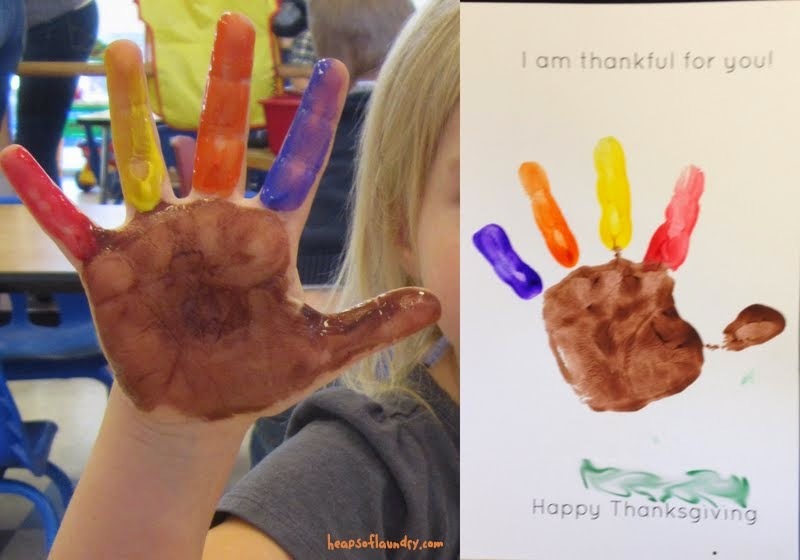 I know Thanksgiving is tomorrow, so there is not a lot of time to create before the big day, but when your tummies are full or while waiting to eat, here are a few things we've done in my preschool class (follow me on Instagram if you like). It all started with the mayflower. This one is quick and requires little, plus there is the fun memento of your kiddo's little hand forever printed on the page. We just used half a sheet of light blue construction paper, had the kids draw on white clouds and blue water (or whatever they wanted, which DID include Elsa!) Then paint one hand brown and plop it on the paper for your boast and masts. Then glue on little white squares for sails. I think I originally saw this in Family Fun magazine. I will go back and check. The turkey gets a lot of play this time of year, however I am pretty certain he never looks like this when I'm about to chow at Thanksgiving dinner. Another simple project. Cut a cheap paper plate in half, glue a peanut shaped (or whatever shape you want your turkey body to be) piece of brown paper to it. If you just draw the shape, the little ones can cut it our themselves. Draw in features (or use other materials - orange paper for a beak, googly eyes, even yarn for that red thing by their beaks). the next part can be done with construction paper, but I think it looks best with tissue paper. Voila! Turkey! We talked in class about how the Wampanoag Indians helped the pilgrims and taught them about corn. 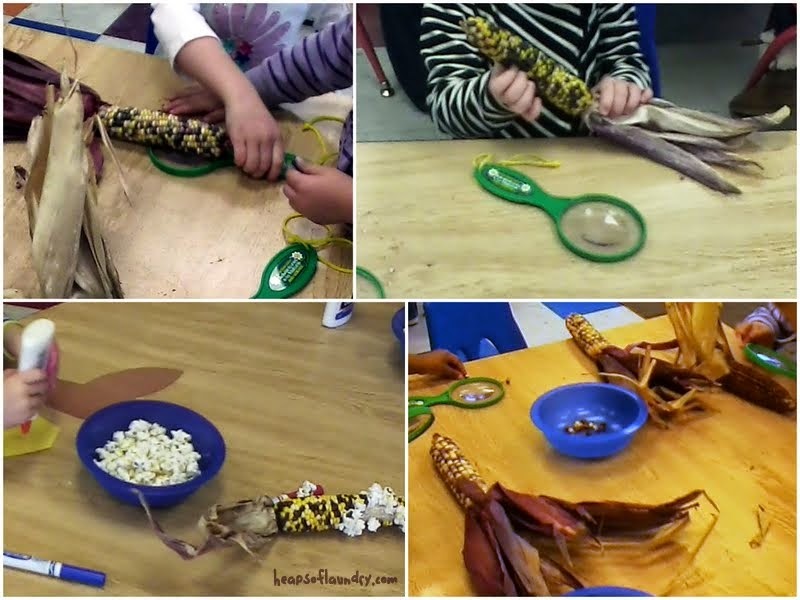 The kids explored the kernels, removed them from the cob, and we also compared field corn to popcorn. Then I air popped a batch of popcorn. I was able to use Indian Corn last year which added in a fun dimension and I even popped it in the microwave to show that even corn on the cob can pop! 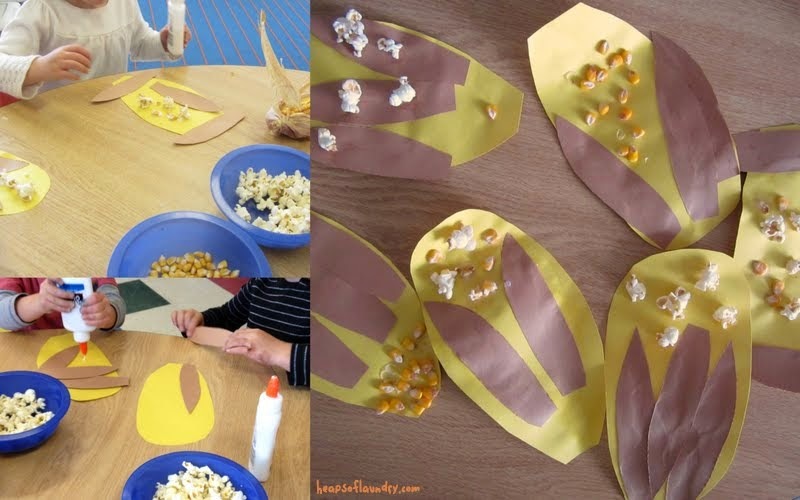 We used both the popped corn and the field corn kernels (popcorn kernels would clearly work too) to create out own harvested corn. I just eyeballed the shapes for the cob and the husks and let them glue everything on however they thought it best. This one is pretty standard this time of year. You can add on some feet, a beak, eyes and all that fun stuff to make it even more fancy. I'll have to look up where I got this idea too, but it is a turkey handshake. First we just started with making it on our own hands before trying to make one with a friend. The open hand is the feathers and the "thumbs up" on its side is the body and head. the kids like this a lot. I always love a little bit on Montessori style work in my classroom. This is not just a simple transferring activity. 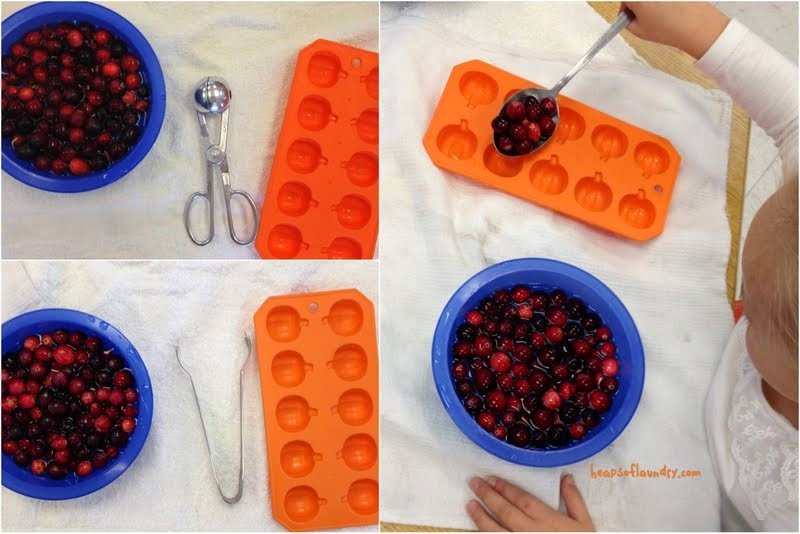 It also can be an introduction to how cranberries are harvested and show that they float (maybe a little sink or float question before filling the bowl up?). There are 3 different utensils I put out for them to transfer with - all bought at the thrift store. The spoon is slotted so the water doesn't really transfer along. This can also just be done with a bowl and any sort of sectioned off container, like an ice cube tray, using the fingers to transfer. This is also good as a sensory activity. 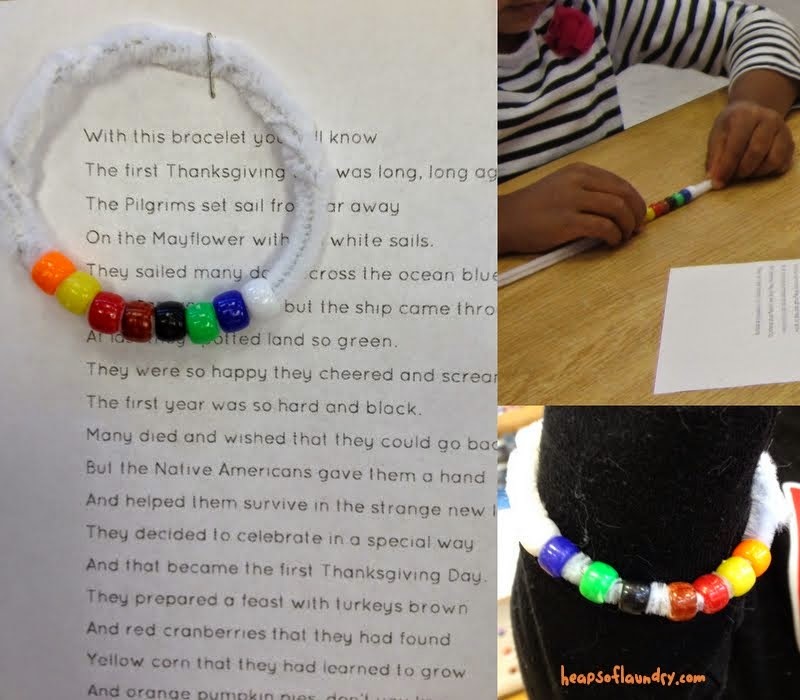 The last one I have for today is this story telling bracelet and poem from Dr. Jean. It's a good way for the kids to have a visual way to remember how the first Thanksgiving came to be. Have a wonderful Thanksgiving and thank you so much for visiting our blog. I just finished up my first year teaching preschool. I feel like I have all the time in the world now (and I was only teaching one half day class twice a week!). I just looked at some stats on our site here and am surprised at the number of daily visitors! Wow, thank you, strangers. Hopefully, we'll get some new things added soon. In the mean time, here are few old posts that might be useful for you as school is getting out and summer is nearly upon us. A Summer "Schedule." This is one my favorite things about summer. It's like I get to do mini homeschooling. We've yet to make our summer "to do" list for this year, but some previous year are listed here, here, and here.